When I think back to my childhood and all the creepy fairy tales I was told growing up, one tale stands out in my mind: The Pied Piper of Hamelin. Rats and mice have always been a nuisance throughout history and our pest control technicians today carry on a vocation that dates back before the origins of the famous pipe-toting rat catcher. However, rodents played an even more sinister role in the Middle Ages than they do today – helping spread the plague known as “The Black Death” which is said to have killed one-third of Europe’s population from 1340-1400. If you’re unfamiliar with the story of the Pied Piper, the tale unfolds like this: The medieval city of Hamelin, Germany is overwrought with rodents. One day, a mysterious man appears in a coat of many colors (pied means having 2 or more colors) claiming to be a ratcatcher of great repute. The city of Hamelin agree to hire the fancy-coated pest expert for a specified price. The Pied Piper begins to play his instrument and subsequently leads all the mice and rats out of the city. After the city was freed of the rodents, the citizens refuse to pay the Pied Piper his expensive fee. Angry and bitter over the city’s reluctance to pay up, the Pied Piper returns one night and leads 130 of the town’s children away with his pipe, never to return again. Needless to say, this story is absolutely terrifying to children and grown men like myself. Ratcatcher’s Day is celebrated in honor of the lost children in the folk tale on July 22nd (the date when the children disappeared according to poet Robert Browning who adapted to folk tale to English). I had a German grandmother who was quite fond of this tale and would take us every summer to the Bavarian-themed town of Frankenmuth, Michigan. A trip to Frankenmuth meant a day of eating candy, playing in the old fashioned arcade, eating the Bavarian Inn’s world-famous chicken and visiting the Glockenspiel to watch the tale of the Pied Piper. 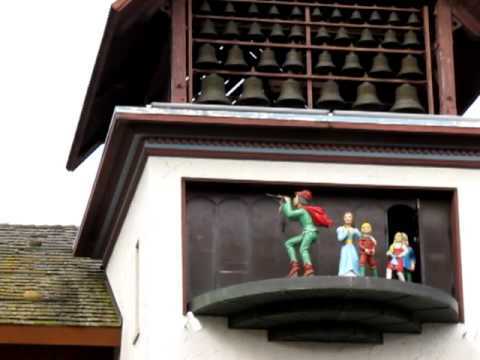 I remember being 5 or 6 and trying to escape my Grandmother’s clutches so I didn’t have to watch the creepy wooden Pied Piper whisk the children and rodents away atop the 35-foot bell tower. But there was no getting around a Heffernan family tradition. To this day, the Glockenspiel is still in use and terrifying new generations of little German-Americans. Although, when I was little, the last thing in the world I wanted to do was see the Pied Piper, I find it somewhat fitting that I now work for a company that helps everyday people solve their rodent problems. From spreading disease to contaminating food, rodents poise numerous threats to human health and safety. Perhaps, I will start planning my 1-year-old daughter’s first trip to Frankenmuth! Do you have any rodent questions? Visit our Rodent FAQ page for answers. Do you have any memories of the Pied Piper? Share below in the comments!